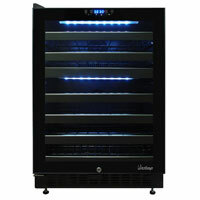 This 46 bottle dual zone touch screen wine cooler is convenient, easy to use and will keep your wines properly stored so they'll be ready for any occasion. A digital controller with blue LED readout allows you to set the VT-46TS-2Z at two different temperatures, one temperature for your reds and one for your whites. Pull-out wire shelves make organizing your bottles an easy task. The wine cooler's black exterior, frameless cabinet, and seamless dual paned glass door with recessed handle will fit nicely with just about any decor. With a front exhaust, this cooler can be a built-in or freestanding unit. Comments: Worst product (my unit broke within a little over a year of it's very costly purchase) and even worse customer service. Apparently, nobody outside of CA will service these units. The repair companies they recommended refused to even look at a vinotemp product. They proceeded to diagnose what could have gone wrong over the phone, charged me several hundred more dollars for parts and, when I finally found someone to attempt to fix it, it still didn't work. To add insult to injury, they refused to take back the parts. I would never buy anything made by Vinotemp again! Bottom Line: I would not recommend this product.